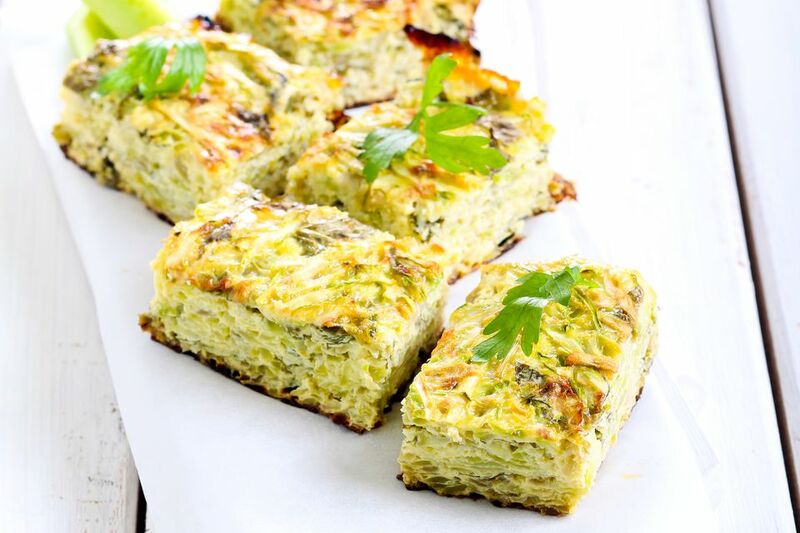 These popular zucchini squares are always a hit. The quiche-like squares are a snap to prepare and bake. The recipe uses store-bought biscuit mix for ease, but you can make your own biscuit baking mix substitute as well. Butter a 9-by-13-by-2-inch baking pan. In a large bowl, combine the biscuit mix, parsley, oregano, pepper, salt, and garlic powder. In a small bowl, whisk the eggs until lightly beaten. Whisk the vegetable oil into the eggs and then add the Parmesan cheese and dry ingredients; stir to blend. Fold in the sliced zucchini and finely chopped onion. Fold the wet and dry ingredients together until just combined (avoid over-mixing), then pour the mixture into the prepared baking pan. Bake in the preheated oven for about 30 minutes, or until lightly browned. Let cool slightly and then cut into squares. Serve Parmesan zucchini squares as an appetizer or side dish.